Every year I tell myself that I will try to get some really good photos during the festival of Diwali (or Deepavali), the Hindu Festival of Lights, I haven’t really made the effort to do this for the last few years. 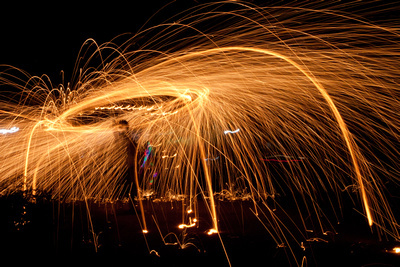 This year I thought I could at least get a photo of one of the many men (yes, and sometimes women/girls) who spin lighted steel-wool in the streets. I think to myself, it can’t be hard right? How can I mess it up? And then I forget the Tripod…. Here’s the resulting image. 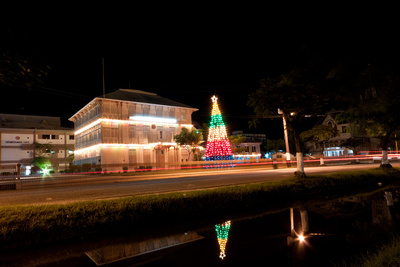 Demerara Mutual has it’s main office on Avenue of the Republic in Central Georgetown, to the right of the photo, you can even see a portion of City Hall. I doubt if I have all the facts, but I think I have the general gist of the thing. For as many years as I can remember, and probably for as many years as I have existed, there have been three “Gas Stations” on Vlissengen Road, right next to one another; from north to south it was Texaco, then Esso and then Shell. I think most Guyanese grew up calling these places Gas Stations, instead of the more internationally acceptable “Petrol Station” or “Service Station”. At Mashramani time, these stations were always popular meeting places, and even “drinking places”. 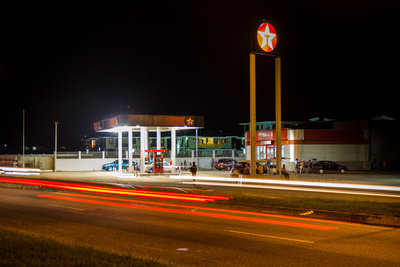 A few years ago, the Shell service stations were purchased by Sol, and are operated under the Shell brand/franchise, shortly after that Sol also bought out the Esso service stations, these now operate either unbranded or as Sol service stations. So at this point Sol had two service station competing with each other, right next door to each other, on Vlissengen Road. I figure that it was only a matter of time before one had to close down. 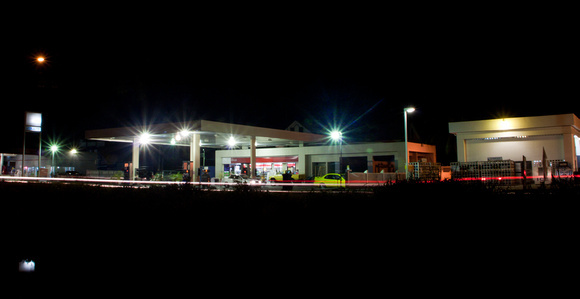 The Esso service Station was known by many as the KC Correia Service Station, and it has been under that management for more years than I care to count. I was told that it is now closing its doors. That is sad, but changes are inevitable and we must either change with it or be left behind. It seems that the old Esso Station was chosen to close its doors over the more modern Shell Station. I took this photo last Friday, not knowing when I would get the chance again.